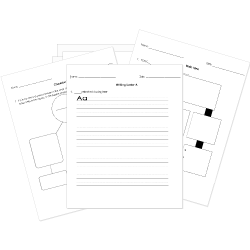 You can create printable tests and worksheets from these Grade 7 Capitalization and Punctuation questions! Select one or more questions using the checkboxes above each question. Then click the add selected questions to a test button before moving to another page. Which sentence shows the correct placement of commas? My spaniel is a fat, sassy, puppy. My spaniel is a fat, sassy puppy. My teacher, mrs. grimsley, told us about the mighty kingdoms and empires that existed for hundreds of years in africa. Which words in the sentence should be capitalized? He said "I want to go to the dance"
He said, "I want to go to the dance". He said "I want to go to the dance." He said, "I want to go to the dance." Julian said he was going to football practice. This week we read Edgar Allan Poe's story, the tell-tale heart. This week we read edgar allan poe's story, The Tell-Tale Heart.. It was a bright, sunny day in dallas, texas. mr. perez could feel the sun's rays on his shoulders as he walked down columbus st.
Dallas, Texas, Mr., Perez, Columbus, St. When people think of Paris, they think of the Eiffel Tower. The Empire state building is a symbol of New York City. Visitors to San Antonio usually want to see the alamo. Words such as east, west, northern, or southern are not capitalized when the words merely indicate direction. However, they are capitalized when they name a particular region. Do not capitalize the name of a season unless it is part of a proper name. Geographical names need to be capitalized. she mumbled to herself, "could it be true? Could mr. dunbar have hidden his treasure at pixley middle school?" Capitalize the names of businesses and the brand names of business products. Only the exact words of the speaker go inside the quotation marks. Capitalize names of organizations, teams, institutions, and government bodies. Ms. Hernandez jumped up and down in class - her students earned 90% advanced and proficient! Ms. Hernandez jumped up and down in class (her students earned 90% advanced and proficient)! Ms. Hernandez jumped up and down in class... her students earned 90% advanced and proficient! Ms. Hernandez jumped up and down in class her students earned 90% advanced and proficient!